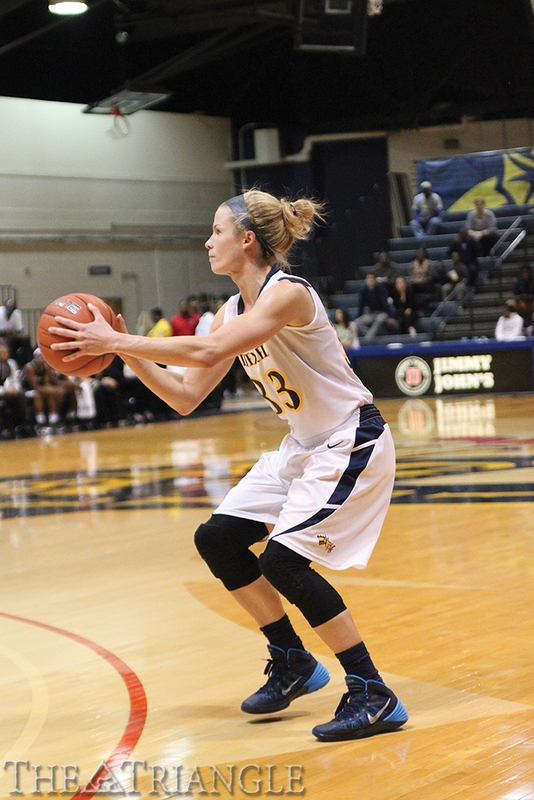 Facing their biggest test of the season, the Drexel women’s basketball team gave the No. 8 University of Maryland its closest competition of the young season. While the Dragons never led in the game, they were able to claw within three before falling short of the victory 69-63. Leading the upset bid for the Dragons were freshmen Alexis Smith and Sarah Curran, who led the team with 16 points each. Curran was the primary offensive contributor for the first 10 minutes of the game, scoring the Dragons’ first 11 points. Along with Curran’s great start, Smith had six points in the first half. Despite Smith’s and Curran’s solid first-half performances, other Dragons struggled to find their rhythm. Only sophomore Meghan Creighton, who scored six points in the first half, had any other points for the Dragons in the first 20 minutes. After a Creighton half-court heave at the halftime buzzer, the Terrapins still led 34-23. In the second half, the Dragons started hitting their shots, and the tempo and style of the game picked up. Three-pointers from sophomore Rachel Pearson and senior Abby Reddick brought the Dragons closer. It became a back-and-forth affair between the two teams for the rest of the game. While the Dragons battled to within three at 60-57 with 5:36 remaining, they couldn’t get any closer. They squandered several opportunities to tie in the following possessions, and instead Maryland increased its lead to nine. Alyssa Thomas led the Terrapins with 21 points and grabbed 14 rebounds; they eventually pulled away with a six-point victory. The win was their hardest fight of the season so far, and Maryland head coach Brenda Frese acknowledged Drexel as a difficult opponent. This was the first time that Drexel played a top-10 team since 2010, when they lost to Texas A&M University by a score of 74-45. Despite the loss, Dillon was proud of the effort her team has shown in every game this season, including this one. The game was a homecoming for Smith — who is from Maryland — and her excellent performance in no way showed the nervousness she had. The Dragons will not return to the court until Dec. 4 against Colgate University, when they will try to put an end to their two-game losing streak.